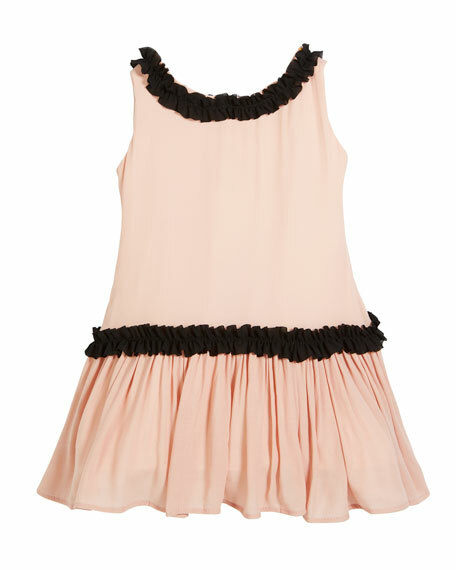 Helena dress with ruffle detailing at waist and neck. Made in the United State of imported materials. Florence Eiseman "Hop To It" stripe seersucker dress. Flower appliqu? ?s at hem. Round neckline; V'd back. Short, ruffle sleeves. Back zip with self-tie. A-line silhouette. Cotton. Imported. Helena "Pretty in Pink" dress in polka-dot pattern. Ruffle trim at chest, waist, and hem. Scoop neckline; hidden back zip. EXCLUSIVELY AT NEIMAN MARCUS Helena dress with allover floral embroidery. Crew neckline. Sleeveless. Hidden back zip. Self-tie at back. Empire waist. A-line silhouette. Polyester. Made in USA of imported material. Luli & Me dress with tonal lace appliqu??s. Smocked and embroidered chest. Crew neckline with tiered, ruffle collar. Short, tiered ruffle sleeves. A-line silhouette. Includes matching bonnet and bloomers. Polyester/cotton. Imported.